This theatre opened as the Fairmont Theatre in 1930, it was later renamed the Roxy Theatre. Closed as a movie theatre in 1945, and now houses retail. 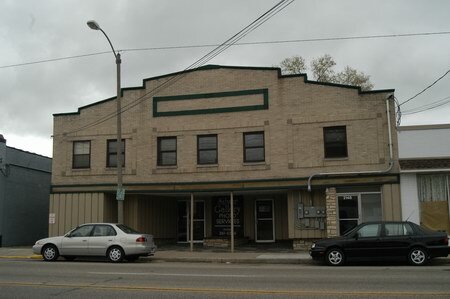 Listed as the Roxy Theatre in Film Daily Yearbook’s;1941 and 1943 editions. Seating capacity is given as 450. 2150 Plainfield In 1949 it is where Blessed Sacrament Church was listed. In 1953 it is vacant. In 1964 it is the gun shop. Sometime between 1953 and 1964 it was a roller rink. Nearby Theaters: Creston Theatre, Crestonette Vaudette Theatre, Stadium Drive-In, Park Theatre, Royal Theatre. Google Maps Street View now: https://www. google. com/maps/@43. 0020307,-85. 6542655,3a,76. 2y,113. 52h,82. 09t/data=!3m6!1e1!3m4!1sI1DAXU6IOtmJ32aOOOYxVw!2e0!7i13312!8i6656!6m1!1e1 Built by Boshoven in 1929 as the Fairmount, and operated by W.
H. Semeyn, this was one of several Grand Rapids theaters named after famous New York City movie houses. S. L.
Rothafel, better known as “Roxy,” was one of the late 1920's top moviehouse impresarios. He was a Minnesota native who had fought in the Boxer Rebellion, played minor league baseball, and mined coal before setting up his first nickelodeon. He later ran such lavish New York venues as the Strand, the Rialto, the Regent, and of course the Roxy. He carved out the opening night entertainment for John D.
Rockefeller's Radio City Music Hall on December 27, 1932. (Source: American Movie Classics Magazine, December, 1999, p. 12. ) The local Roxy Theater was closed by the mid-1940's. 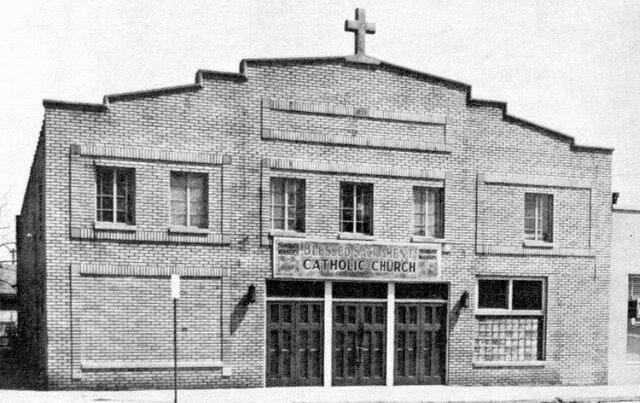 In 1946 it was purchased by the newly-established Blessed Sacrament Catholic parish for $35,000, and for an additional $15,000 was remodeled into its first church. The projection room was converted into quarters for the pastor. The congregation worshiped here until 1950, when a combination church-school building was built on Diamond Avenue. For some years afterwards, the building was used as a roller skating arena. I moved to Grand Rapids in 1945 and I cannot recall this building ever being a theater. 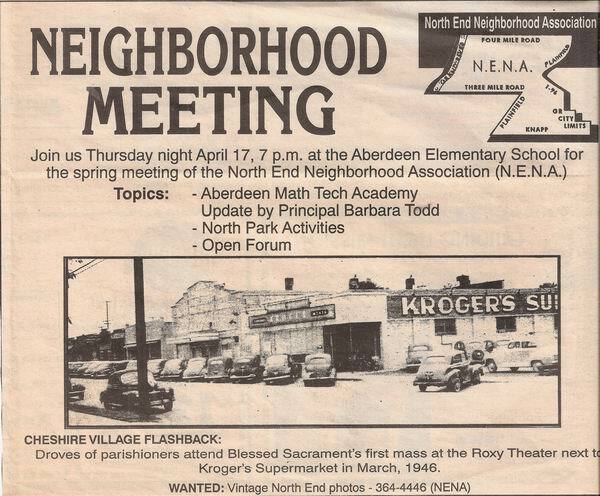 The depression was exceptionally hard on neighborhood houses. Became a roller rink in the early 50's. This theatre appears to have been closed some time ago, a photo services store and a couple of other tenants appear to occupy the building now. It would be interesting to find out what became of the auditorium.